A Wright's stainled bone marrow aspirate smear from a person with precursor B-cell acute lymphoblastic leukemia. Smoking, family history, ionizing radiation, some chemicals, prior chemotherapy, Down syndrome. The exact cause of leukemia is unknown. A combination of genetic factors and environmental (non-inherited) factors are believed to play a role. Risk factors include smoking, ionizing radiation, some chemicals (such as benzene), prior chemotherapy, and Down syndrome. People with a family history of leukemia are also at higher risk. 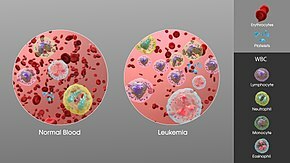 There are four main types of leukemia—acute lymphoblastic leukemia (ALL), acute myeloid leukemia (AML), chronic lymphocytic leukemia (CLL) and chronic myeloid leukemia (CML)—as well as a number of less common types. Leukemias and lymphomas both belong to a broader group of tumors that affect the blood, bone marrow, and lymphoid system, known as tumors of the hematopoietic and lymphoid tissues. Clonal eosinophilias (also called clonal hypereosinophilias) are a group of blood disorders characterized by the growth of eosinophils in the bone marrow, blood, and/or other tissues. They may be pre-cancerous or cancerous. Clonal eosinophilias involve a "clone" of eosinophils, i.e., a group of genetically identical eosinophils that all grew from the same mutated ancestor cell. These disorders may evolve into chronic eosinophilic leukemia or may be associated with various forms of myeloid neoplasms, lymphoid neoplasms, myelofibrosis, or the myelodysplastic syndrome. Transient myeloproliferative disease, also termed transient leukemia, involves the abnormal proliferation of a clone of non-cancerous megakaryoblasts. The disease is restricted to individuals with Down syndrome or genetic changes similar to those in Down syndrome, develops in a baby during pregnancy or shortly after birth, and resolves within 3 months or, in ~10% of cases, progresses to acute megakaryoblastic leukemia. Transient myeloid leukemia is a pre-leukemic condition. The most common symptoms in children are easy bruising, pale skin, fever, and an enlarged spleen or liver. White blood cells, which are involved in fighting pathogens, may be suppressed or dysfunctional. This could cause the person's immune system to be unable to fight off a simple infection or to start attacking other body cells. Because leukemia prevents the immune system from working normally, some people experience frequent infection, ranging from infected tonsils, sores in the mouth, or diarrhea to life-threatening pneumonia or opportunistic infections. Some people experience other symptoms, such as feeling sick, having fevers, chills, night sweats, feeling fatigued and other flu-like symptoms. Some people experience nausea or a feeling of fullness due to an enlarged liver and spleen; this can result in unintentional weight loss. Blasts affected by the disease may come together and become swollen in the liver or in the lymph nodes causing pain and leading to nausea. The word leukemia, which means 'white blood', is derived from the characteristic high white blood cell count that presents in most afflicted people before treatment. The high number of white blood cells is apparent when a blood sample is viewed under a microscope, with the extra white blood cells frequently being immature or dysfunctional. The excessive number of cells can also interfere with the level of other cells, causing further harmful imbalance in the blood count. Some people diagnosed with leukemia do not have high white blood cell counts visible during a regular blood count. This less-common condition is called aleukemia. The bone marrow still contains cancerous white blood cells which disrupt the normal production of blood cells, but they remain in the marrow instead of entering the bloodstream, where they would be visible in a blood test. For a person with aleukemia, the white blood cell counts in the bloodstream can be normal or low. Aleukemia can occur in any of the four major types of leukemia, and is particularly common in hairy cell leukemia. Large doses of Sr-90 emission from nuclear reactor accidents, nicknamed bone seeker increases the risk of bone cancer and leukemia in animals, and is presumed to do so in people. Chronic myelogenous leukemia is associated with a genetic abnormality called the Philadelphia translocation; 95% of people with CML carry the Philadelphia mutation, although this is not exclusive to CML and can be observed in people with other types of leukemia. The increase in white blood cells in leukemia. Following diagnosis, blood chemistry tests can be used to determine the degree of liver and kidney damage or the effects of chemotherapy on the person. When concerns arise about other damages due to leukemia, doctors may use an X-ray, MRI, or ultrasound. These can potentially show leukemia's effects on such body parts as bones (X-ray), the brain (MRI), or the kidneys, spleen, and liver (ultrasound). CT scans can be used to check lymph nodes in the chest, though this is uncommon. Despite the use of these methods to diagnose whether or not a person has leukemia, many people have not been diagnosed because many of the symptoms are vague, non-specific, and can refer to other diseases. For this reason, the American Cancer Society estimates that at least one-fifth of the people with leukemia have not yet been diagnosed. 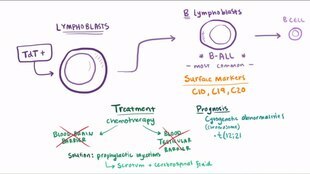 Consolidation therapy or intensification therapy to eliminate any remaining leukemia cells. There are many different approaches to consolidation, but it is typically a high-dose, multi-drug treatment that is undertaken for a few months. People with low- to average-risk ALL receive therapy with antimetabolite drugs such as methotrexate and 6-mercaptopurine (6-MP). People who are high-risk receive higher drug doses of these drugs, plus additional drugs. CNS prophylaxis (preventive therapy) to stop the cancer from spreading to the brain and nervous system in high-risk people. Standard prophylaxis may include radiation of the head and/or drugs delivered directly into the spine. Alternatively, allogeneic bone marrow transplantation may be appropriate for high-risk or relapsed people. For most people with CLL, it is incurable by present treatments, so treatment is directed towards suppressing the disease for many years, rather than totally and permanently eliminating it. The primary chemotherapeutic plan is combination chemotherapy with chlorambucil or cyclophosphamide, plus a corticosteroid such as prednisone or prednisolone. The use of a corticosteroid has the additional benefit of suppressing some related autoimmune diseases, such as immunohemolytic anemia or immune-mediated thrombocytopenia. In resistant cases, single-agent treatments with nucleoside drugs such as fludarabine, pentostatin, or cladribine may be successful. Younger and healthier people may choose allogeneic or autologous bone marrow transplantation in the hope of a permanent cure. Many different anti-cancer drugs are effective for the treatment of AML. Treatments vary somewhat according to the age of the person and according to the specific subtype of AML. Overall, the strategy is to control bone marrow and systemic (whole-body) disease, while offering specific treatment for the central nervous system (CNS), if involved. There are many possible treatments for CML, but the standard of care for newly diagnosed people is imatinib (Gleevec) therapy. Compared to most anti-cancer drugs, it has relatively few side effects and can be taken orally at home. With this drug, more than 90% of people will be able to keep the disease in check for at least five years, so that CML becomes a chronic, manageable condition. In a more advanced, uncontrolled state, when the person cannot tolerate imatinib, or if the person wishes to attempt a permanent cure, then an allogeneic bone marrow transplantation may be performed. This procedure involves high-dose chemotherapy and radiation followed by infusion of bone marrow from a compatible donor. Approximately 30% of people die from this procedure. People with hairy cell leukemia who are symptom-free typically do not receive immediate treatment. Treatment is generally considered necessary when the person shows signs and symptoms such as low blood cell counts (e.g., infection-fighting neutrophil count below 1.0 K/µL), frequent infections, unexplained bruises, anemia, or fatigue that is significant enough to disrupt the person's everyday life. People who need treatment usually receive either one week of cladribine, given daily by intravenous infusion or a simple injection under the skin, or six months of pentostatin, given every four weeks by intravenous infusion. In most cases, one round of treatment will produce a prolonged remission. Other treatments include rituximab infusion or self-injection with Interferon-alpha. In limited cases, the person may benefit from splenectomy (removal of the spleen). These treatments are not typically given as the first treatment because their success rates are lower than cladribine or pentostatin. Most people with T-cell prolymphocytic leukemia, a rare and aggressive leukemia with a median survival of less than one year, require immediate treatment. T-cell prolymphocytic leukemia is difficult to treat, and it does not respond to most available chemotherapeutic drugs. Many different treatments have been attempted, with limited success in certain people: purine analogues (pentostatin, fludarabine, cladribine), chlorambucil, and various forms of combination chemotherapy (cyclophosphamide, doxorubicin, vincristine, prednisone CHOP, cyclophosphamide, vincristine, prednisone [COP], vincristine, doxorubicin, prednisone, etoposide, cyclophosphamide, bleomycin VAPEC-B). Alemtuzumab (Campath), a monoclonal antibody that attacks white blood cells, has been used in treatment with greater success than previous options. Some people who successfully respond to treatment also undergo stem cell transplantation to consolidate the response. The success of treatment depends on the type of leukemia and the age of the person. Outcomes have improved in the developed world. The average five-year survival rate is 61% in the United States. In children under 15, the five-year survival rate is greater (60 to 85%), depending on the type of leukemia. In children with acute leukemia who are cancer-free after five years, the cancer is unlikely to return. Outcomes depend on whether it is acute or chronic, the specific abnormal white blood cell type, the presence and severity of anemia or thrombocytopenia, the degree of tissue abnormality, the presence of metastasis and lymph node and bone marrow infiltration, the availability of therapies and the skills of the health care team. Treatment outcomes may be better when people are treated at larger centers with greater experience. Leukemia was first described by anatomist and surgeon Alfred-Armand-Louis-Marie Velpeau in 1827. 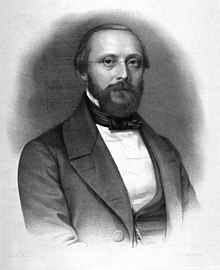 A more complete description was given by pathologist Rudolf Virchow in 1845. Around ten years after Virchow's findings, pathologist Franz Ernst Christian Neumann found that the bone marrow of a deceased person with leukemia was colored "dirty green-yellow" as opposed to the normal red. This finding allowed Neumann to conclude that a bone marrow problem was responsible for the abnormal blood of people with leukemia. In 1962, researchers Emil J. Freireich, Jr. and Emil Frei III used combination chemotherapy to attempt to cure leukemia. The tests were successful with some people surviving long after the tests. Observing an abnormally large number of white blood cells in a blood sample from a person, Virchow called the condition Leukämie in German, which he formed from the two Greek words leukos (λευκός), meaning "white", and haima (αἷμα), meaning "blood". Significant research into the causes, prevalence, diagnosis, treatment, and prognosis of leukemia is being performed. Hundreds of clinical trials are being planned or conducted at any given time. Studies may focus on effective means of treatment, better ways of treating the disease, improving the quality of life for people, or appropriate care in remission or after cures. In general, there are two types of leukemia research: clinical or translational research and basic research. Clinical/translational research focuses on studying the disease in a defined and generally immediately applicable way, such as testing a new drug in people. By contrast, basic science research studies the disease process at a distance, such as seeing whether a suspected carcinogen can cause leukemic changes in isolated cells in the laboratory or how the DNA changes inside leukemia cells as the disease progresses. The results from basic research studies are generally less immediately useful to people with the disease. Treatment through gene therapy is currently being pursued. One such approach used genetically modified T cells to attack cancer cells. In 2011, a year after treatment, two of the three people with advanced chronic lymphocytic leukemia were reported to be cancer-free and in 2013, three of five subjects who had acute lymphocytic leukemia were reported to be in remission for five months to two years. Identifying stem cells that cause different types of leukaemia is also being researched. ^ "Leukemia". Merriam-Webster. Archived from the original on 6 October 2014. ^ a b c d e f "What You Need To Know About™ Leukemia". National Cancer Institute. 23 December 2013. Archived from the original on 6 July 2014. Retrieved 18 June 2014. ^ a b c d e f g h i j "A Snapshot of Leukemia". NCI. Archived from the original on 4 July 2014. Retrieved 18 June 2014. ^ a b c d e Hutter, JJ (June 2010). "Childhood leukemia". Pediatrics in Review. 31 (6): 234–41. doi:10.1542/pir.31-6-234. PMID 20516235. ^ a b c "SEER Stat Fact Sheets: Leukemia". National Cancer Institute. 2011. Archived from the original on 16 July 2016. ^ a b c d e World Cancer Report 2014. World Health Organization. 2014. pp. Chapter 5.13. ISBN 978-9283204299. ^ Vardiman, JW; Thiele, J; Arber, DA; Brunning, RD; Borowitz, MJ; Porwit, A; Harris, NL; Le Beau, MM; Hellström-Lindberg, E; Tefferi, A; Bloomfield, CD (30 July 2009). "The 2008 revision of the World Health Organization (WHO) classification of myeloid neoplasms and acute leukemia: rationale and important changes". Blood. 114 (5): 937–51. doi:10.1182/blood-2009-03-209262. PMID 19357394. ^ Cătoi, Alecsandru Ioan Baba, Cornel (2007). Comparative oncology. Bucharest: The Publishing House of the Romanian Academy. p. Chapter 17. ISBN 978-973-27-1457-7. Archived from the original on 10 September 2017. ^ a b c d American Cancer Society (2 March 2014). "Survival rates for childhood leukemia". Archived from the original on 14 July 2014. ^ Finding Cancer Statistics » Cancer Stat Fact Sheets »Chronic Lymphocytic Leukemia Archived 16 April 2008 at the Wayback Machine National Cancer Institute. ^ Colvin G. A.; Elfenbein G. J. (2003). "The latest treatment advances for acute myelogenous leukemia". Medicine and Health, Rhode Island. 86 (8): 243–6. PMID 14582219. ^ "Novartis Oncology". Archived from the original on 5 November 2013. ^ Patients with Chronic Myelogenous Leukemia Continue to Do Well on Imatinib at 5-Year Follow-Up Archived 15 May 2013 at the Wayback Machine Medscape Medical News 2006. ^ Updated Results of Tyrosine Kinase Inhibitors in CML Archived 29 December 2007 at the Wayback Machine ASCO 2006 Conference Summaries. ^ Matutes Estella (1998). "T-cell prolymphocytic leukemia, a rare variant of mature post-thymic T-cell leukemias, has distinct clinical and laboratory characteristics and a poor prognosis". Cancer Control Journal. 5 (1). Archived from the original on 11 February 2009. ^ Valbuena JR, Herling M, Admirand JH, Padula A, Jones D, Medeiros LJ (March 2005). "T-cell prolymphocytic leukemia involving extramedullary sites". American Journal of Clinical Pathology. 123 (3): 456–64. doi:10.1309/93P4-2RNG-5XBG-3KBE. PMID 15716243. Archived from the original on 15 May 2013. ^ a b Reiter A, Gotlib J (2017). "Myeloid neoplasms with eosinophilia". Blood. 129 (6): 704–714. doi:10.1182/blood-2016-10-695973. PMID 28028030. ^ Gotlib J (2015). "World Health Organization-defined eosinophilic disorders: 2015 update on diagnosis, risk stratification, and management". American Journal of Hematology. 90 (11): 1077–89. doi:10.1002/ajh.24196. PMID 26486351. ^ Arber DA, Orazi A, Hasserjian R, Thiele J, Borowitz MJ, Le Beau MM, Bloomfield CD, Cazzola M, Vardiman JW (2016). "The 2016 revision to the World Health Organization classification of myeloid neoplasms and acute leukemia". Blood. 127 (20): 2391–405. doi:10.1182/blood-2016-03-643544. PMID 27069254. ^ Crispino JD, Horwitz MS (April 2017). "GATA factor mutations in hematologic disease". Blood. 129 (15): 2103–2110. doi:10.1182/blood-2016-09-687889. PMC 5391620. PMID 28179280. ^ Clarke, RT; Van den Bruel, A; Bankhead, C; Mitchell, CD; Phillips, B; Thompson, MJ (October 2016). "Clinical presentation of childhood leukaemia: a systematic review and meta-analysis". Archives of Disease in Childhood. 101 (10): 894–901. doi:10.1136/archdischild-2016-311251. PMID 27647842. ^ a b American Cancer Society (2010). "How is Leukemia Diagnosed?". Detailed Guide: Leukemia – Adult Chronic. American Cancer Society. Archived from the original on 5 April 2010. Retrieved 4 May 2010. ^ a b Ross JA, Kasum CM, Davies SM, Jacobs DR, Folsom AR, Potter JD (August 2002). "Diet and risk of leukemia in the Iowa Women's Health Study". Cancer Epidemiol. Biomarkers Prev. 11 (8): 777–81. PMID 12163333. Archived from the original on 10 September 2017. ^ Radivoyevitch, T; Sachs, R K; Gale, R P; Molenaar, R J; Brenner, D J; Hill, B T; Kalaycio, M E; Carraway, H E; Mukherjee, S (2015). "Defining AML and MDS second cancer risk dynamics after diagnoses of first cancers treated or not with radiation". Leukemia. 30 (2): 285–294. doi:10.1038/leu.2015.258. PMID 26460209. ^ a b c d e f Wiernik, Peter H. (2001). 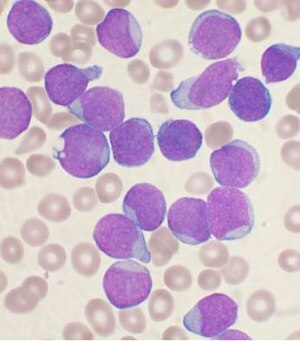 Adult leukemias. New York: B. C. Decker. pp. 3–15. ISBN 978-1-55009-111-3. ^ a b Robinette, Martin S.; Cotter, Susan; Van de Water (2001). Quick Look Series in Veterinary Medicine: Hematology. Teton NewMedia. p. 105. ISBN 978-1-893441-36-1. ^ Stass, Sanford A.; Schumacher, Harold R.; Rock, William R. (2000). Handbook of hematologic pathology. New York, N.Y: Marcel Dekker. pp. 193–194. ISBN 978-0-8247-0170-3. ^ Leonard, Barry (1998). Leukemia: A Research Report. DIANE Publishing. p. 7. ISBN 978-0-7881-7189-5. ^ Rudant J, Amigou A, Orsi L, Althaus T, Leverger G, Baruchel A, Bertrand Y, Nelken B, Plat G, Michel G, Sirvent N, Chastagner P, Ducassou S, Rialland X, Hémon D, Clavel J (2013). "Fertility treatments, congenital malformations, fetal loss, and childhood acute leukemia: the ESCALE study (SFCE)". Pediatr Blood Cancer. 60 (2): 301–8. doi:10.1002/pbc.24192. PMID 22610722. ^ "Sr-90 is known to increase the risk of bone cancer and leukemia in animals, and is presumed to do so in people; from google (nuclear reactor emit tritium) result 1, 2, 3". Archived from the original on 20 July 2017. ^ Pasmant, E; Ballerini, P; Lapillonne, H; Perot, C; Vidaud, D; Leverger, G; Landman-Parker, J (2009). "SPRED1 disorder and predisposition to leukemia in children". Blood. 114 (5): 1131. doi:10.1182/blood-2009-04-218503. PMID 19643996. ^ Salesse, Stephanie; Verfaillie, Catherine M. (9 December 2002). "BCR/ABL: from molecular mechanisms of leukemia induction to treatment of chronic myelogenous leukemia". Oncogene. 21 (56): 8547–8559. doi:10.1038/sj.onc.1206082. ISSN 0950-9232. PMID 12476301. ^ "NCI Dictionary of Cancer Terms". National Cancer Institute. 2 February 2011. Archived from the original on 16 February 2017. Retrieved 15 February 2017. ^ "Do We Know What Causes Chronic Myeloid Leukemia?". www.cancer.org. Archived from the original on 16 February 2017. Retrieved 15 February 2017. ^ "What is chronic myeloid leukaemia? (CML) - Understanding - Macmillan Cancer Support". www.macmillan.org.uk. Archived from the original on 16 February 2017. Retrieved 15 February 2017. ^ a b c Non-Ionizing Radiation, Part 1: Static and Extremely Low-Frequency (ELF) Electric and Magnetic Fields (IARC Monographs on the Evaluation of the Carcinogenic Risks). Geneva: World Health Organisation. 2002. pp. 332–333, 338. ISBN 978-92-832-1280-5. Archived from the original on 6 December 2008. ^ "WHO | Electromagnetic fields and public health". Archived from the original on 16 February 2009. Retrieved 18 February 2009. ^ Hoffbrand, A.V. ; Moss, P.A.H. ; Pettit, J.E. (2006). Essential haematology (5th ed.). Malden, Mass. : Blackwell Pub. ISBN 978-1-4051-3649-5. ^ National Cancer Institute (1 January 1980). "Chronic Lymphocytic Leukemia (PDQ) Treatment: Stage Information". Archived from the original on 17 October 2007. Retrieved 4 September 2007. ^ Eichhorst BF; Busch R; Hopfinger G; Pasold R; Hensel M; Steinbrecher C; Siehl S; Jäger U; Bergmann M; Stilgenbauer S; Schweighofer C; Wendtner CM; Döhner H; Brittinger G; Emmerich B; Hallek M; German CLL Study Group. (2006). "Fludarabine plus cyclophosphamide versus fludarabine alone in first-line therapy of younger patients with chronic lymphocytic leukemia". Blood. 107 (3): 885–91. doi:10.1182/blood-2005-06-2395. PMID 16219797. ^ Gribben JG (January 2008). "Stem cell transplantation in chronic lymphocytic leukemia". Biol. Blood Marrow Transplant. 15 (1 Suppl): 53–8. doi:10.1016/j.bbmt.2008.10.022. PMC 2668540. PMID 19147079. ^ American Cancer Society (22 March 2012). "Typical treatment of acute myeloid leukemia (except promyelocytic M3)". Detailed Guide: Leukemia – Acute Myeloid (AML). American Cancer Society. Archived from the original on 12 November 2012. Retrieved 31 October 2012. ^ a b c Fausel C (October 2007). "Targeted chronic myeloid leukemia therapy: seeking a cure" (PDF). J Manag Care Pharm. 13 (8 Suppl A): 8–12. PMID 17970609. Archived (PDF) from the original on 28 May 2008. ^ Robak, T; Jamroziak, K; Gora-Tybor, J; Blonski, J. Z.; Kasznicki, M; Dwilewicz-Trojaczek, J; Wiater, E; Zdunczyk, A; Dybowicz, J; Dmoszynska, A; Wojtaszko, M; Zdziarska, B; Calbecka, M; Kostyra, A; Hellmann, A; Lewandowski, K; Stella-Holowiecka, B; Sulek, K; Gawronski, K; Skotnicki, A. B.; Nowak, W; Zawilska, K; Molendowicz-Portala, L; Kloczko, J; Sokolowski, J; Warzocha, K; Seferynska, I; Ceglarek, B; Konopka, L (2007). "Cladribine in a weekly versus daily schedule for untreated active hairy cell leukemia: Final report from the Polish Adult Leukemia Group (PALG) of a prospective, randomized, multicenter trial". Blood. 109 (9): 3672–5. doi:10.1182/blood-2006-08-042929. PMID 17209059. ^ Saven, A; Burian, C; Adusumalli, J; Koziol, J. A. (1999). "Filgrastim for cladribine-induced neutropenic fever in patients with hairy cell leukemia". Blood. 93 (8): 2471–7. PMID 10194424. ^ a b c d Dearden CE, Matutes E, Cazin B (September 2001). "High remission rate in T-cell prolymphocytic leukemia with CAMPATH-1H". Blood. 98 (6): 1721–6. doi:10.1182/blood.V98.6.1721. PMID 11535503. ^ "JMMLfoundation.org". JMMLfoundation.org. Archived from the original on 25 January 2009. Retrieved 29 August 2010. ^ Stock, W (2010). "Adolescents and young adults with acute lymphoblastic leukemia". Hematology. American Society of Hematology. Education Program. 2010: 21–9. doi:10.1182/asheducation-2010.1.21. PMID 21239766. ^ Lozano R, Naghavi M, Foreman K, Lim S, Shibuya K, Aboyans V, Abraham J, Adair T, Aggarwal R, Ahn SY, Alvarado M, Anderson HR, Anderson LM, Andrews KG, Atkinson C, Baddour LM, Barker-Collo S, Bartels DH, Bell ML, Benjamin EJ, Bennett D, Bhalla K, Bikbov B, Bin Abdulhak A, Birbeck G, Blyth F, Bolliger I, Boufous S, Bucello C, Burch M, Burney P, Carapetis J, Chen H, Chou D, Chugh SS, Coffeng LE, Colan SD, Colquhoun S, Colson KE, Condon J, Connor MD, Cooper LT, Corriere M, Cortinovis M, de Vaccaro KC, Couser W, Cowie BC, Criqui MH, Cross M, Dabhadkar KC, Dahodwala N, De Leo D, Degenhardt L, Delossantos A, Denenberg J, Des Jarlais DC, Dharmaratne SD, Dorsey ER, Driscoll T, Duber H, Ebel B, Erwin PJ, Espindola P, Ezzati M, Feigin V, Flaxman AD, Forouzanfar MH, Fowkes FG, Franklin R, Fransen M, Freeman MK, Gabriel SE, Gakidou E, Gaspari F, Gillum RF, Gonzalez-Medina D, Halasa YA, Haring D, Harrison JE, Havmoeller R, Hay RJ, Hoen B, Hotez PJ, Hoy D, Jacobsen KH, James SL, Jasrasaria R, Jayaraman S, Johns N, Karthikeyan G, Kassebaum N, Keren A, Khoo JP, Knowlton LM, Kobusingye O, Koranteng A, Krishnamurthi R, Lipnick M, Lipshultz SE, Ohno SL, Mabweijano J, MacIntyre MF, Mallinger L, March L, Marks GB, Marks R, Matsumori A, Matzopoulos R, Mayosi BM, McAnulty JH, McDermott MM, McGrath J, Mensah GA, Merriman TR, Michaud C, Miller M, Miller TR, Mock C, Mocumbi AO, Mokdad AA, Moran A, Mulholland K, Nair MN, Naldi L, Narayan KM, Nasseri K, Norman P, O'Donnell M, Omer SB, Ortblad K, Osborne R, Ozgediz D, Pahari B, Pandian JD, Rivero AP, Padilla RP, Perez-Ruiz F, Perico N, Phillips D, Pierce K, Pope CA, Porrini E, Pourmalek F, Raju M, Ranganathan D, Rehm JT, Rein DB, Remuzzi G, Rivara FP, Roberts T, De León FR, Rosenfeld LC, Rushton L, Sacco RL, Salomon JA, Sampson U, Sanman E, Schwebel DC, Segui-Gomez M, Shepard DS, Singh D, Singleton J, Sliwa K, Smith E, Steer A, Taylor JA, Thomas B, Tleyjeh IM, Towbin JA, Truelsen T, Undurraga EA, Venketasubramanian N, Vijayakumar L, Vos T, Wagner GR, Wang M, Wang W, Watt K, Weinstock MA, Weintraub R, Wilkinson JD, Woolf AD, Wulf S, Yeh PH, Yip P, Zabetian A, Zheng ZJ, Lopez AD, Murray CJ, AlMazroa MA, Memish ZA (December 2012). "Global and regional mortality from 235 causes of death for 20 age groups in 1990 and 2010: a systematic analysis for the Global Burden of Disease Study 2010". Lancet. 380 (9859): 2095–128. doi:10.1016/S0140-6736(12)61728-0. hdl:10536/DRO/DU:30050819. PMID 23245604. ^ World Cancer Report 2014. World Health Organization. 2014. pp. Chapter 5.13. ISBN 978-9283204299. ^ Amitay, EL; Keinan-Boker, L (1 June 2015). "Breastfeeding and Childhood Leukemia Incidence: A Meta-analysis and Systematic Review". JAMA Pediatrics. 169 (6): e151025. doi:10.1001/jamapediatrics.2015.1025. PMID 26030516. ^ a b c "Leukemia Facts & Statistics." Archived 16 April 2009 at the Wayback Machine The Leukemia & Lymphoma Society. Retrieved 2 July 2009. ^ "Leukaemia (all subtypes combined) statistics". Cancer Research UK. Archived from the original on 7 October 2014. Retrieved 27 October 2014. ^ Patlak, M (2002). "Targeting leukemia: From bench to bedside". FASEB Journal. 16 (3): 273. doi:10.1096/fj.02-0029bkt. PMID 11874976. ^ Sontag, Susan (1978). Illness as Metaphor. New York: Farrar, Straus and Giroux. p. 18. ISBN 978-0-374-17443-9. ^ "A Snapshot of Leukemia". NCI. Archived from the original on 4 July 2014. Retrieved 18 June 2014. ^ "Search of: leukemia — List Results — ClinicalTrials.gov". Archived from the original on 15 September 2010. ^ "Understanding Clinical Trials for Blood Cancers" (PDF). Leukemia and Lymphoma Society. Archived from the original (PDF) on 5 January 2011. Retrieved 19 May 2010. ^ Jaslow, Ryan. "New Leukemia Therapy Destroys Cancer by Turning Blood Cells into "Assassins"". CBSnews.com HealthPop section. Archived from the original on 31 March 2014. Retrieved 11 August 2011. ^ "How we're beating leukaemia". Leukaemia & Lymphoma Research. Archived from the original on 27 September 2013. Retrieved 24 September 2013. ^ a b c d Shapira T, Pereg D, Lishner M (September 2008). "How I treat acute and chronic leukemia in pregnancy". Blood Rev. 22 (5): 247–59. doi:10.1016/j.blre.2008.03.006. PMID 18472198. ^ a b Koren G, Lishner M (2010). "Pregnancy and commonly used drugs in hematology practice". Hematology Am Soc Hematol Educ Program. 2010: 160–5. doi:10.1182/asheducation-2010.1.160. PMID 21239787. 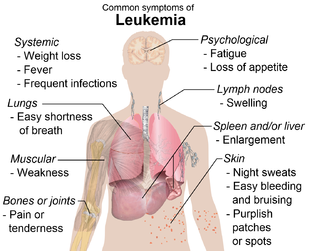 Wikimedia Commons has media related to Leukemias.